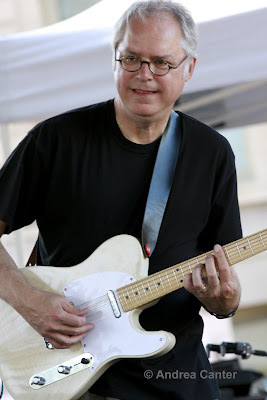 Guitarist and composer Bill Frisell has had so many projects that I am not uncomfortable admitting that I have not really enjoyed them all – I couldn’t always “get it” enough to hear that thread of meaning. But often I have been moved by the music and always intrigued by this one musician with so many voices, so many different collaborators, particularly his work with Paul Motian and Joe Lovano in recent years. But the project coming to the Walker Art Center this weekend (February 6th) is perhaps the most intriguing yet—music for guitar, viola and oud with a cross-cultural ensemble that includes middle America native Frisell, American born Chinese violist Eyvind Kang, and oud master/ Iraqui native Rami AlHaj. They’ll be performing a Walker-commissioned work, Baghdad/Seattle Suite. This is Frisell’s second commission from the Walker—he composed Blue Dreams back in 1999. I got a preview of the music and an opportunity to hear these musicians discuss the art of improvisation in the context of a small clinic with high school musicians at the MacPhail Center for Music. I “sat in” on the clinic, representing the Dakota Foundation for Jazz Education, primary funder of the Dakota Combo. The Combo along with MacPhail’s Advanced Jazz Ensemble were the targets of the clinic, presented courtesy of the Walker. Frisell, Kang and AlHaj had arrived two days earlier to spend some relaxed time rehearsing for Saturday’s program. They loved the time here, off the merry-go-round of touring. No, it wasn’t too cold and they didn’t mind the snow. It was just good to be in a friendly, arts-centric city without the usual frenzy of their work. Normally, Thursday night is rehearsal night for the Dakota Combo, our seven, 9-12th grade extremely talented jazz musicians, selected by audition in September. Their year so far has included biweekly rehearsals, a weekend performing and in clinic with saxophonist Tia Fuller, and preparing for the upcoming MMEA Night with the Shell Lake Faculty Ensemble. They’ve been working with director Adam Linz on very difficult music from the likes of Charles Mingus and Tim Hagans, and refining their own compositions. School visits, a concert at MacPhail, the summer jazz festival loom ahead. 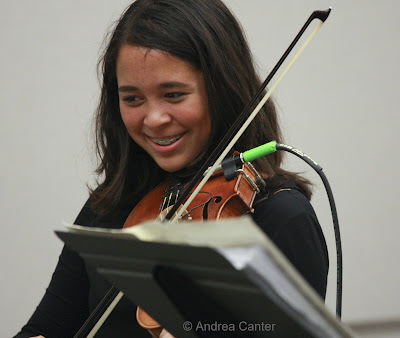 As well as all the activities that are normal to teenagers and many that are not—these students participate in multiple school and community ensembles, some gig on their own. Ramin noted that “improvisation is part of our tradition... if you don’t improvise, you are not a musician.” He described the written works of classical music as “frozen compositions” and the traditional structures of the maqam (Arabic music structures of notes akin to modes) as naturally feeding improvisation—“like connecting towns by building bridges—town to bridge to the next town with millions of options... there’s a difference between playing notes and playing music.” Eyvind added “We are not computers... it is not possible to be exact, everyone will be different” in their musical choices, which is the essence of improvisation. It was time to reverse roles, and the Dakota Combo took the stage to play for these internationally acclaimed artists. They started with “Drunken Monkey Framing Company,” written by pianist Quentin Tschofen. The music conjures images consistent with the title, Quentin reaching inside the piano to accompany Danny Hupp’s slippery, songful tenor sax solo. Zosha Warpeha’s violin solo was filled with glissando and double stops and, perhaps, the slithery sounds of drunken monkeys. The Combo picked Tim Hagans’ “Waking Iris” for its second tune, featuring John Cushing’s trombone calls, Anna Buchholz’s flowing alto, fine soloing from Quentin and bassist Caitlin Keliher, another strong effort from Danny, this time on alto. Cam LeCrone drove the beat with sophisticated punctuations throughout. Applause... and the ultimate compliment—Bill Frisell’s “You guys sound great.” From Eyvind: “My compliments on the sound of your instruments. I am amazed! The sound is so refined on every instrument.” Added Ramin, “You are really tight....you have distinctive voices. It is most important to speak your voice—always define your voice.” The MacPhail Advanced Combo followed with the last tune of the night, an original entitled “Sixth Sense,” featuring some hefty tenor soloing. And more compliments from the pros, directed not only at the students but to their instructors, Adam Linz (Dakota Combo) and Bryan Nichols (MacPhail Advanced Ensemble). After an evening of artistic, cultural and generational exchange, we left looking forward to hearing Frisell and cohorts in concert. And to hearing more from the young musicians who spend nights at MacPhail defining their voices. Photos: (top to bottom): Bill Frisell at the 2009 Iowa City Jazz Festival; Zosha Warpeha, Dakota Combo performance in December. Photos by Andrea Canter. The Walker did not allow photos except from their own photographer during the clinic.